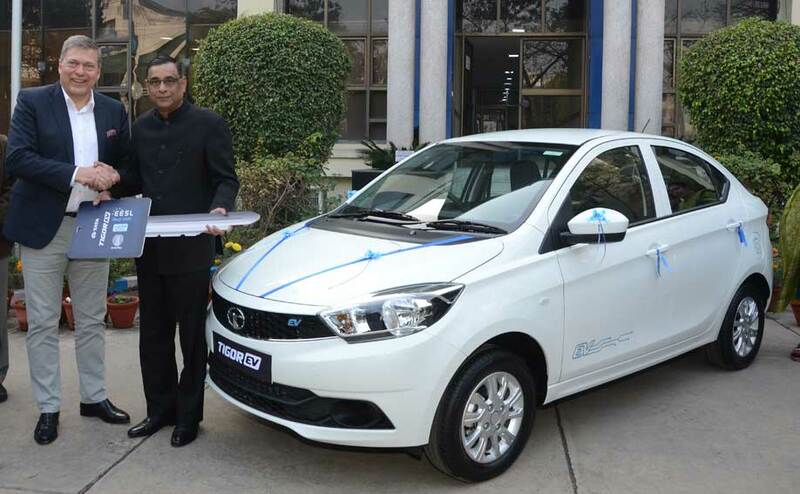 Tata Motors today delivered the first set of Tigor Electric Vehicles (EVs) to state-run Energy Efficiency Services Limited (EESL) as part of their initiative to procure 10,000 electric vehicles. Guenter Butschek, CEO & MD, Tata Motors handed over the keys of the Tigor EVs to Saurabh Kumar, Managing Director, EESL, accompanied by the senior management teams from both the companies. The Tigor EV is a full electric, zero emission ‘StyleBack’ that comes with a stunning, break-free and revolutionary design, set to build on the existing Passenger Vehicles portfolio of Tata Motors. Specific to the EESL order, the Tigor EV will be delivered in three trim variants – Base, Premium and High and will be available in ‘Pearlescent White’ colour with blue decals. Over the basic requirements of the tender, the Tigor EV, across the variants, would have FATC (Fully Automatic AC) to provide maximum comfort to its occupants. Equipped with a single speed, automatic transmission, the Tigor EV will also allow the customers to enjoy the driving experience, maximized efficiency and seamless acceleration. The electric drive systems for the Tigor EV is developed and supplied by Electra EV – a company established to develop and supply electric drive systems for the automotive sector. Tata Motors had qualified as L1 bidder in the midst of stiff competition and won the tender floated by EESL in September 2017. For phase 1, Tata Motors is required to deliver 250 Tigor EVs, for which it has received a LoA. Tata Motors Limited, a USD 42 billion organization, is a leading global automobile manufacturer of cars, utility vehicles, buses, trucks and defence vehicles. As India’s largest automobile company and part of the USD 100 billion Tata group, Tata Motors has operations in the UK, South Korea, Thailand, South Africa, and Indonesia through a strong global network of 76 subsidiary and associate companies, including Jaguar Land Rover in the UK and Tata Daewoo in South Korea. In India, Tata Motors has an industrial joint venture with Fiat. Engaged in engineering and automotive solutions, with a focus on future-readiness and a pipeline of tech-enabled products, Tata Motors is India’s market leader in commercial vehicles and among the top in passenger vehicles with 9 million vehicles on Indian roads. The company’s innovation efforts are focused on developing auto technologies that are sustainable as well as suited. With design and R&D centres located in India, the UK, Italy and Korea, Tata Motors strives to pioneer new products that fire the imagination of GenNext customers. Abroad, Tata cars, buses, and trucks are being marketed in Europe, Africa, the Middle East, South Asia, South East Asia, South America, Australia, CIS, and Russia.